Nigerian president Buhari is reportedly on his way tonight to London for medical check up. This is coming after foreign doctors were flown into the country, to take care of the sick Nigerian President. It was also gathered that his length of stay will be determined on how well he responds to treatment, as he has already handed over to Vice-President Yemi Osinbajo. 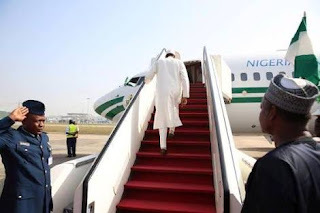 The state ment below was given by his media aide Femi Adesina "President Muhammadu Buhari proceeds to London tonight for follow-up medical consultation with his doctors. He had planned to leave Sunday afternoon, but decided to tarry a bit, due to the arrival of 82 Chibok girls who arrived Abuja earlier in the day. The President wishes to assure all Nigerians that there is no cause for worry. He is very grateful for the prayers and good wishes of the people, and hopes they would continue to pray for the peace and unity of the nation. The length of the President's stay in London will be determined by the doctors. Government will continue to function normally under the able leadership of the Vice President. In compilance with "section 145 (1) of the 1999 constitution". President Buhari has transmitted letters about the trip to the Senate and the House of Representatives.